In this chapter, you not only discover how to teach your dog basic directions, but you find out what each exercise conveys from your dog’s perspective. Though other books cover obedience exercises for competition at dog shows or focus on age appropriate puppy training, this book looks at daily interactions and the basic skills necessary to live peaceably with your dog. Dogs, like kids, need a sense of structure and predictability to feel safe and connected, but unlike children, they aren’t born prewired to understand our language: We must teach them. Think of educating your dog like teaching a foreigner English as a second language; be patient and encouraging. I’m the Leader! Follow Me! When walking your dog, one of you leads, while the other follows. Though you may not consider this scenario to be of consequence, your dog does. From her perspective, the two of you constitute a pack, a team, if you will. When you leave your home to explore life beyond the den, there are untold possibilities. One of you simply must be the decision-maker. If you walk your dog on a leash, the restriction is immediately noted. Your dog will choose to either trot at your side, trusting in your authority, or she will strain forth, eager to give direction and determined to break free of the asphyxiating restraint — a posture that ensures an alertness to all distractions. If your dog has any protective instincts, your inattention will convey a dependence on his leadership. In this role, he’ll react to whatever sight he deems unsafe, whether real or imagined. Though reactions run the spectrum from aggression to fear, all convey a perceived sense of duty. If your dog is allowed to run free and is known to roam, he’ll mark strategic points as he wanders, claiming a territory that may be quite large. On leash or off, he’ll alert to and/or address anyone who enters this area. If he’s confined, he’ll still react to what he considers incursions on his turf and noises and sights from his enclosure. Common reactions to the stress of watching activities from his confinement may include barking, destructive chewing, digging, or marking. Near-sighted and visually limited (see Seeing Life from Your Dog’s Perspective), the world looks filtered and distant to your dog. He depends on his sense of smell to recognize places. Though his olfactory recognition is a powerful tool, it’s not comparable to our vision as a long-range interpreter. Unfamiliar objects “appear” foreign and can’t be identified until they’re thoroughly sniffed. When possible, let your dog smell an unfamiliar item. Otherwise, teach him to follow you so that you’re perceived as the social director. The only thing your dog really needs to focus on is you! The good news is that you can avoid many common frustrations by teaching your dog to follow your lead, passively conveying your role as your dog’s guardian and protector. As you work with him, remember that he’s programmed to look to you for direction: Use hand signals with your directions as often as possible (see Figure 12-1). The first ingredient necessary to train your dog involves improving your attitude. Be the one to watch! If you act confidently, like a respected coach with good ideas, your dog will admire you and respond to your direction. Whoever is in front is in charge. The first step in conditioning good behavior is to ensure that, inside your home den and out, your dog follows and looks for your direction. Figure 12-1: Use hand signals with your directions. Place your dog on a leash and fitted collar. See Inspiring Behavior with Motivational Techniques to help you determine which leash and collar are best for your dog. Call out your dog’s name and the direction “Follow” as you move about in a clockwise circle pattern. If your dog tugs forward on the leash, either guide him back using your leash or simply reverse your direction and stride away, leaving the dog behind you at the end of his leash and forcing him to recognize that he’s no longer in front but now must run to catch up with you. Slap your leg periodically as a body signal and praise and/or treat your dog to reward his cooperation. When walking your dog, throw your shoulders back, stick your chest out, and smile. If you poke along or putter, your dog will be concerned and hesitate. Keep your pace lively and consistent, and he’ll eagerly anticipate following your direction. Repeat the dog’s name “follow” periodically and praise her cooperation. As your dog alerts to this word cue, use it in increasingly more distracting environments. Continue to use treats or click-treat combinations to encourage your dog’s cheerful cooperation. For more on rewarding your dog and using a clicker, see Inspiring Behavior with Motivational Techniques. Once your dog is familiar with the “Follow” direction, reinforce this skill on walks outside of your home and yard. Does the concept of training your dog seem like a downer — something you do to him, rather than for or with him? Many people cringe at the thought of ordering their dog about. Though we fully understand your hesitation, we must speak up for your dog. Just feeding, loving, and giving him shelter aren’t enough: He longs for the direction. Like a child, he depends on you to civilize him and to teach him the best ways to act in every situation. When you do so, you become his hero. As a young dog, he’ll be unable to contain his impulses, but allowing unruly displays isn’t kind. If you don’t train him to behave, he’ll become a brat. Your dog needs you to teach him how to manage each feeling, emotion, or impulse as it arises. Replace the word “training” with “civilizing” and then embrace your real responsibility to your dog: teacher, friend, coach, and hero, your direction is his ticket to a wonderful life. Ask yourself, which dog has the greater freedom — the one that has never been trained and therefore must be left at home because his misbehaving is a problem, or the one that has been well trained and can accompany you anywhere? A welltrained dog is not only civilized, but he’s earned his freedom. Encourage your dog to walk to one side and be consistent. Dogs are as habitual as humans. Once they learn a walking position in relationship to you, they’ll rarely vary. If you’re right-handed, walk your dog on the left. Though it may seem awkward at first, it’s better that your dog not get in the way when you’re manipulating objects. When walking your dog, you may come to crosswalks, roadways, or streams. Teach your dog to stop and look to you frequently for permission before moving into new terrain. This exercise ensures adequate containment skills and enforces a feeling of trust and protection. When your dog stops and waits for your permission, you’re communicating your responsibility and that you’ll ensure his safety before proceeding into new environments. If your dog doesn’t sit or stand still, brace him as described in Seeing Life from Your Dog’s Perspective. Be still until your dog is sitting or standing calmly. Say “okay” and proceed with confidence. As you progress to walking your dog in more distracting environments, you’re likely to encounter other pets, as well as human admirers. Don’t let your dog drag you across the yard or road to greet anyone. Not only is this unsafe behavior, it’s extremely rude and could easily result in disaster. A far better approach is to teach your dog to “Sit” or “Wait” for your permission. 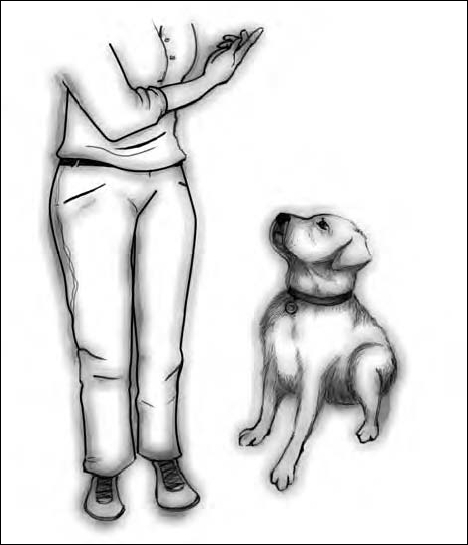 Once forewarned, if the other party is willing, you may release your dog with the direction “Okay.” This training is all part of the dog learning to act only on your permission. To do it effectively, you may need to teach your dog to harness his impulses (see the next section). Maturity: Maturity is the result of both experience and biological setting. A distraction becomes increasingly less enticing the more often your dog experiences it. As your dog ages, psychological and physiological changes will have a relaxing effect on his personality as well. Your interaction: If you correct your dog when he’s reacting to a distraction, he’ll think you’re supporting him or competing for a prized item. Instead, focus on your surroundings, intervene, or just distract him before your dog has taken matters into his own hands. T & C: In professional circles, T & C stand for time and consistency, the two necessary ingredients to learn any skill. The more you expose your dog to distractions, routinely providing the same direction and structure, the faster he’ll become conditioned to events and react automatically. “No” must be taught as a direction, not a correction. Using “No” as a punishment will only confuse your dog, who really doesn’t have the mental or emotional capacity to understand the concept of being bad. Even though he’s a relatively simple and spontaneous creature, your dog can learn to harness specific impulses out of trust in your direction and respect for your authority. Just like a child can adapt to a set structure, so can your dog. To teach him “No,” place him on a leash and rig a situation to prompt his interest, such as placing a tissue on the floor or a tray of snacks on the coffee table. As you approach the distraction, watch your dog’s ears, nose, and/or eyes to determine his focus. The moment he alerts to a distraction, lightly tug the leash and either slap your leg or rap loudly on the wall (with your hand). Don’t interact with your dog until he’s pulled away from the distraction and then redirect him to a positive activity and praise him warmly. If you correct your dog in the midst of an action, he’s likely to interpret your attention as interactive, not instructional. Instead, set up situations that allow you to correct your dog the moment he even considers a misdeed. If you’re too late, you’re far better off saying nothing and simply containing your dog until such time as your communication will make a lasting impression. This may sound silly, but it works. If the thing that commonly distracts or attracts your dog is an inanimate object, such as a tissue or a sandwich, slap and angrily admonish it by saying “Bad Sandwich!” Don’t look at your dog. Following several repetitions, dogs often come to avoid or look away from the punished object. No! This direction must carry a tone of finality that your dog will learn to respect. Use it very selectively for impulsive actions that will endanger your dog or others. Don’t even think about it! If you catch your dog warily eyeing or sniffing an item or activity, he’s considering it. Nip it in the bud with a well-toned, growl-sounding utterance, “Don’t even think about it!” If he’s unimpressed, back yourself up with a firm leash tug and set up situations to allow practice of this direction. For example, once your dog has learned to avoid the countertops, leave a sandwich close to the edge. Place a can full of pennies just in front of the plate to facilitate your interference should he ignore you. As you leave the room, look seriously at your dog and instruct “Don’t even think about it.” If you hear the can rustle, come back into the room swiftly. If your dog hasn’t nabbed the sandwich, slap the table and say “Bad Table,” and then direct your dog back to a bone or bed. Repeat this process in two days and again until this direction begins to make an impression. An untrained dog often needs a leash tug to maintain control. Think of a leash as an extension of your hand, which is always in contact with your dog — which is the way your dog thinks of it! The tug, however, should be gentle. It’s a reminder that you’re in contact with him, and is a way of getting his attention; it’s not a punishment. In addition to general praise, teach your dog a specific word or phrase, such as “Yes” or “Good dog,” to tell him that you’re pleased and to reinforce his cooperation. In the early stages, follow each “Yes” or “Good dog” with a treat or other reward. After a while, just the sounds of the words will get a happy response from your dog, and you can use the word as a reward, even if the dog is off leash and some distance away. The direction “down” asks your dog to move into a vulnerable, submissive pose. Initially, he may not be a big fan of this direction, especially if he doesn’t think of you as the leader of his pack. Your first job is to convey a sense of neutrality, so that your dog neither fears the direction nor reacts defensively. As you practice, he’ll be more cooperative in familiar, peaceful environments and around distractions. Start with the dog sitting beside you. If your dog is unfamiliar with this direction, use lures to guide him into position. For example, show him a treat and then move it from a position above his head in a downward arc that ends a foot or so in front of the dog’s paws at the level of the floor. As he lowers himself to the floor, say “Down” as you release the prize. Don’t be concerned if he pops up immediately: You can teach the “Stay” command another time. When your dog is routinely cooperating, hold the reward in your other hand as you say “Down” and give him a hand signal that looks like the motion you used to lure him down. If he doesn’t cooperate, you might physically correct him by using the pressure point (between his shoulder blades), pause as you bring the treat to his mouth, and then praise and reward him. Incrementally increase the duration of the pause: When your dog is showing signs of self-control, say “Stay” during the pause. When you’re luring your dog into this position, slowly move the prize downward from your dog’s nose directly between his front paws. Point training, as described in Inspiring Behavior with Motivational Techniques, is ideal for signaling all your directions: Point as you lure and then continue to use this signal as you faze off luring him. Straight back down: Once your dog is cooperating with the preceding command, kneel next to him or sit at his side in a low chair. Keep your back straight: Your goal is to direct him from an upright posture. If you don’t eliminate your bending, it will become a body cue necessary for his cooperation. In this posture, don’t lower your hand to the floor, but signal him by moving your hand in a short downward movement in front of his face. If your dog stops moving when your hand stops, use your free hand to press him into position gently. Distraction down: As you bring this direction into normal everyday situations, you may notice that your dog is notably less responsive. Although she may react immediately in the quiet of your home, when distracted, this direction can take on a whole new meaning. Loss of face, end of interaction, submission . . . your dog may look at you like you’ve never met. Don’t be discouraged, and above all else, don’t repeat yourself! By keeping a few treats in your pocket at all times, you can turn any situation where the dog isn’t responding into a training opportunity. Eventually, the dog learns that the same commands have the same meanings and potential for rewards in every situation. This direction instructs your dog to stay put and contain his impulses. In addition to enhancing his focusing skills, long-distance stays can help to ease separation anxiety (see Countering Anxiety-Based Behavior). Begin with your dog in a “Sit” position. Turn around so that you’re in front of your dog with his nose close to your knees. If he moves, tell him to “Sit” again, repeating the “Stay” command and the hand signal. In the beginning, you can expect him to hold his position only for a few seconds. Later, you can stretch out the time and increase your distance from him. Keep your lessons short, upbeat, and fun to ensure your dog’s interest and enthusiasm. Simplify each exercise, building your dog’s confidence before proceeding to more difficult distractions or long durations. If your dog routinely breaks the command, consider whether you’re asking too much of him. Make the exercise easier by making the stay times shorter, thus enabling his success rather than setting him up for failure. In addition to short, concentrated lessons, practice the “Stay” exercise with the dog at various distances from you throughout the day. Secure a short 3-foot leash in a familiar area, such as a play station (see Communicating with Your Dog). Place bedding and toys within reach. Secure the pre-attached leash to his regular collar or harness, helping him to sit or lie down. Instruct him to “Settle down” (see Seeing Life from Your Dog’s Perspective). If your dog is nervous, stay close by him until he seems more settled. Walk about the room or relax nearby. Don’t pay attention to him if he whines or barks in protest, though you may praise him when he’s chewing a toy or resting calmly. Once your dog is comfortable with this routine, instruct him to “Settle down” and leave the room for gradually increasing periods of time (not to exceed 30 minutes). If he protests wildly, watch him in order to prevent injury or household destruction. Then continue practicing until he’s more comfortable settling down with you in the room. If your dog seems agitated upon your return, don’t look at or address him until he’s calmed down. Remember, you reinforce whatever you pay attention to. Concentrate your attention on your dog only when he is calm. He’ll quickly learn to accept your departures or chew his bone, which is an appropriate activity to relieve anxiety. Your dog’s response to the command “Come,” or to any command when he is off leash, depends upon his desire to be near you. This pack mentality stems from a dog’s social instinct to reconnect with and look to others before acting. Provided your dog respects your direction, and has confidence in your control, he will respond. Taught in an upbeat, fun manner, the following instructions will ensure that the direction “Come” will be one your dog’s favorites. Being able to bring your dog to you when he’s at a distance is one of the most vital things that you must teach him. It can save his life if he’s moving toward a dangerous place or situation. If he doesn’t respond to your call, your dog really can’t be considered to be under control. Psychologically, however, responding to your “Come” command isn’t easy. Consider what you’re asking your dog to do when you ask him to come. You demand that he curtail his activities instantly. Then he’s suppose to drop everything and race over to you full throttle — a wholly unnatural behavior whether you’re dog or human. If that weren’t enough, your dog is then supposed to gauge his speed and do a perfect four-point stop at your feet. And then, well maybe you’ll offer him praise or a little treat. It takes a lot of effort and self-control for a dog to respond, especially if your dog is young or untrained. Try this little “Come” exercise on your significant other. Wait until he’s fully engrossed in a pleasurable activity, such as golfing, reading, or watching the television. Call out his name. Does he look up? Regardless, ask him to come with you. Any luck? Unlikely! If you habitually use this term to call the dog to you when you want to punish or scold him, then don’t be surprised if he doesn’t respond or even turns and runs. Encourage your dog to cheerfully alert to his name. Call his name as you shake a treat cup, wave a toy, or use your clicker (Inspiring Behavior with Motivational Techniques). Call his name in an inviting manner to encourage his enthusiasm. Avoid using your dog’s name if you’re preparing to isolate or groom him. “Come” should always invite generous tail wagging. To teach your dog that “Come” means togetherness, not separation, use this direction whenever you’re physically interacting or rewarding him. Suddenly, “Come” becomes a welcome command, rather than an uncertain one. Now use the word “Come” to bring the dog with you from a distance. Begin calling him on leash from short distances. Call your dog’s name, cheering him on when he responds to you, or pat your legs or back away to encourage him to move and then praise him or give him a treat when he responds. “Come” should be your dog’s favorite direction. Don’t call your dog every other second. If you default to “Come” as a means of controlling or curtailing your dog’s every move, he won’t like it. Come must be a welcome invitation to reconnect. When your dog is running at you from a distance, use the human exclamation point (arms enthusiastically thrown up in the air), the praise words “Yes” or “Good dog” or a quick clap of your hands to signal your delight. Steer clear of making “Come” a serious direction. The more your dog views this direction as fun, the more you’ll guarantee his quick response when it matters most. Use it throughout the day when you’re playing with or treating your dog. Run away come game: Place your dog on a drag leash (Inspiring Behavior with Motivational Techniques) inside or out. When you have his attention, run away from him as you say “Come.” Vary the distance of the chase, kneel down, and give him a treat and a pat. Hide and seek: You can play this one-on-one or with a partner. With treat cup in hand, wait for your dog to be distracted and then hide behind a tree or sofa. Call your dog’s name and shake the cup, ducking out if you sense your dog is confused. When he finds you, say “Come” and reward him. The goal of off lead training is that your dog responds to you with a higher priority than he gives to anything else. Dog owners often desire off-leash long before a dog is mature or fully capable of containing his impulses. This level of control requires a comfortable response to all directions, including “No,” which, when used appropriately, can arrest an instinct to chase or explore. As you practice your distance skill, use an extendible leash or long line to restrict your dog’s freedom to roam while you work on your greater distance control. Please don’t allow your dog off leash near civilization. Even a welltrained dog can lose focus and dart off impulsively, racing into a street and putting himself in danger or frightening children or others who don’t know him. As your dog learns to take direction, he’ll become more focused and fully entwined with your daily interactions. He’ll grow increasingly aware of your moods and what distracts you. Your dog may note that you don’t follow through with your directions when company visits, or that off leash you don’t have the same level of control. If your goal is to have a responsive, off-leash dog, pay close attention to your behavior. When practicing your long-range skills, be mindfully aware to only ask your dog to do something when you can follow through, when you’re sure that he’ll respond correctly, or when you’re able to enforce your command. Name: A dog’s name should really mean “Look at me. The next sound that comes out of my mouth is an instruction for you.” It should precede any command. Thus “Lassie, sit” or “Lassie, down” is proper grammar when talking to your dog, while “Sit, Lassie” isn’t because the dog will be looking at you and waiting for a command that has already disappeared into the ether. A quick check-in is all you’re looking for here — the human equivalent of looking up from an activity when your name is called. When your dog looks to you, give him a cheer. If he continues by coming to you, you may offer a treat, although you don’t require this response. If your dog ignores you, leash him and issue a light tug, or step close to him and touch him to attract his attention or even hold the leash and step off in the opposite direction. Ignoring your calling his name isn’t an option. Let’s go! : This direction is slightly looser than “Follow,” which instructs your dog to walk by your left side. “Let’s go!” doesn’t direct your dog to your side per se, but does encourage him to follow you. Use it whenever you’re changing directions. If your dog is unresponsive, simply leave him on lead and give him a light reminder tug; like other directions, not following you is not an option.